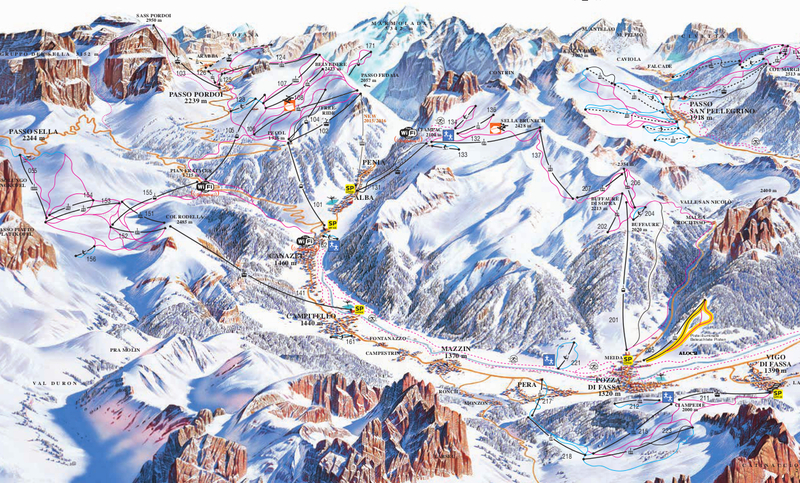 Val di Fassa – diverse and comprehensive. Crossing Passo Fedaia takes a quick 20 minute drive from Casa Alfredino. Canazei, it’s main village is well known and is a hive of activity during the season. It’s bright and busy, a world apart from Val Pettorina. Here you will hear not only Italian and German being spoken, but Russian, Polish, Slovakian and the other Slav languages as well as tourism from the ex eastern bloc has exploded. And for good reason – the skiing is truly excellent. It’s broken into 3 contiguous areas, Penia di Alba – Pozza di Fassa, the area around the Sella group from Passo Pordoi across to Sella Pass, and also an area beneath the east face of the Cantenaccio from Vigo to Fassa to Pera. They can be skied individually or as a little tour using bus services to link them which makes for a great day out. I’ll describe the areas clockwise as this makes for good skiing. It is worth noting that Passo Fedaia is not always open; when there has been heavy snow fall the road becomes particularly treacherous as the steep hairpins half way up the pass become very slippery and especially so on the way down. In this event you can either drive around and start from Arabba or the Pordoi Pass, or better still, jump on the lift to Monte Padon and ski over to Passo Pordoi – there’s certainly no time penalty doing this. If you do, just be aware that it’s quite a long trip and unless you ski fast you may not make it all the way around the loop we’ve described here. So check your watches and be sensible – I don’t even want to contemplate how much a taxi back would cost – certainly over 100 Euro! Penia di Alba – Pozza di Fassa. Starting from Alba you catch a lift up to a bowl with some great skiing in it. It’s often quiet and is a little out of the way for most. But this makes it a useful resource – because the run back to the car park is black it makes it better for the more advanced skier. There are a few reds in the shadow of Collac and from the looks of it, some good side country offpiste, especially if you are prepared to walk a little way along the western rim of the choire. The 132 lift leads to the edge of this area, where you can then cross over to reach the Buffare area above Pozza di Fassa. These are incredibly long, fun red runs – especially the one down to Pozza which just seems to go on for ever, dashing down through the trees, winding away and inducing a real thigh burn! Here abouts the geology changes slightly and the mountains are less vertiginous – what that means is you are afforded excellent panoramic views whilst high up, and there are a number of lifts to achieve this – from the Sella group, to the Marmolada, and Sassopiatto to the Latemar you can take it all in. And most of the time you will be skiing on your own. Once you reach Pozza you can pick up a bus to get to Vigo from near the Skipass office. Vigo di Fassa to Pera. Vigo is a pretty little village nestled at the start of the road to Passo di Carreza. The lift at the top of the village whisks you up to a beautiful partially wooded ski area. Again you have fantastic views, especially to the Rosengarten/Cantenaccio where you can see the famous Vajiolet towers and the imposing 600m east face to the Cima del Cantenaccio. The runs are excellent too – with some steep, wide red runs down through the open forest and also a black to test yourself on which is particularly steep and used for slalom competitions. It’s quite a small area, but provides a great afternoons entertainment. And when you’re finished there is a long blue schuss back down to Pera and another bus ride. Campitello di Fassa to Alba. The final area is by far the most extensive, and as a consequence much busier. A fast gondola from Campitello di Fassa brings you to the summit of Col Rodella. The opening run is exceedingly fun – quite steep but wide. For the adventurous, if you keep left you can head down a really excellent piece of side country at about 35 degrees and often pretty much unskied. The run leads down into a large bowl by the Sella Pass where you can easily spend an hour or two exploring the runs. Sometimes there is also a boarder cross run for those who fancy a little racing fun. There are a great number of excellent places to eat and some good bars too. It’s well worth heading to the new hotel at the pass if you need something to eat. Not only is the food and drink here really excellent, but also this has to be one of the most stunning places on earth, with extensive views to the north to Sassolungo, the Odle and Puez range and the Sellaspitze. You will most likely think you’ve died and gone to heaven. Of course from here you can cross over into Val Gardena, just make sure you have a Super Dolomiti skipass if you do so otherwise you will not be able to return. Once you’ve had your fill, head down to the “Lupo Bianco” via a most agreeable red. It’s long and mostly pretty easy with only a couple of steeper pitches. It can get very busy though so take care at crossings as people tend to congregate just over the brow of the hill! Once you reach Lupo Bianco you can either turn right and keep skiing for a further 5-6 km all the way down to Canazei (be warned there is quite a long walk back to the village especially if you have stiff downhill ski boots) or you can continue up towards Passo Pordoi and the Belvedere. This area is large and busy. The runs are good and there is some fun side country plus a boardercross run. Again this area leads into the next, and crossing over the pass at the Belvedere leads you towards Arabba so make sure you have the right pass if you go down the other side. But your pass does allow you to ski to Pordoi pass and then take the Gondola up to the top of Sass Pordoi – this is a really worthwhile detour. It’s about as high as you can get in the ski range without walking and it’s great just to look at the mountains. That said it’s also the starting point for some awesome offpiuste runs, but I’ll cover that in a different article. And last to mention is that as of 2016 there is a link directly back to Penia di Alba with a new lift which you can take back down to your start point. If you end up in Canazei there is also a bus back to Alba too. In all this final area provides enough runs for a good couple of days so well worth visiting.